Arby's at 6833 Van Nuys Blvd appears to be closing down to make way for a Starbucks which most likely means the loss of the infamous Arby's cowboy hat sign. Does this mean more folks are into coffee than a roast beef sandwich on Van Nuys Blvd? Hopefully Valley Relics can save this one. You can read the LA Planning Hearing notice here. On a side note, this location was also used in the 2006 film, 10 Items or Less, starring Morgan Freeman. 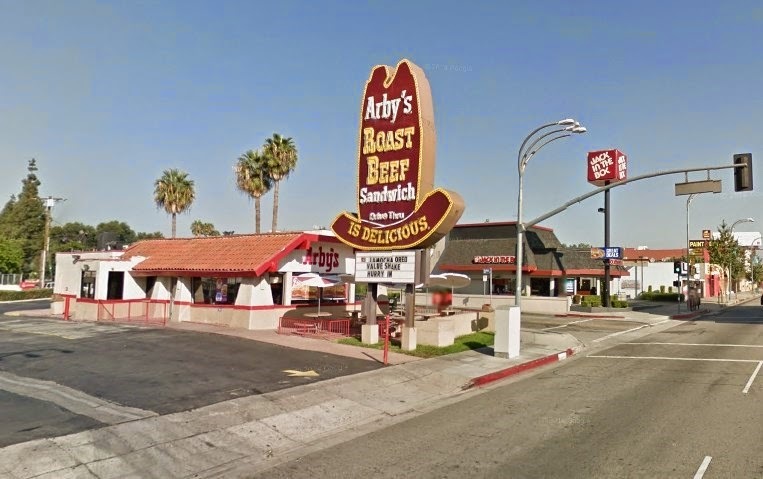 2 comments to ''Starbucks to Replace Arby's in Van Nuys"
OH NO! Now I won't be able to get an Arby's Roast Beef Sandwich when I get our Saturn Vue service at Keyes Chevrolet. I hate coffee! Starbuck doesn't have real lemon for their tea, just that freeze dried crap. Their coco tastes nasty like chalk!